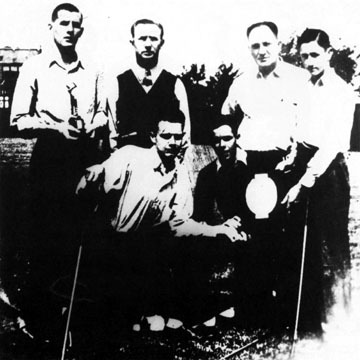 The Illinois High School Association awarded its first team title in golf in 1938, the initial tournament being played in Peoria at Mt. Hawley Country Club and won by Peoria Central High School. But there was great confusion over the team title, apparently because of a lack of explanation by the IHSA of the rules used to determine the team championship. When the two-day, 36-hole tournament was over, LaGrange had needed 689 strokes from its four-man team and Central 690. For Central, Gene Modjeska, later to be a Peoria city champion, shot 79-78--157, just one stoke behind the winner, Ed Wysowski of Kewanee; Bob McCord had 84-84--168; Art Andrews, Jr. 81-86--167; and Bob Groetzinger 98-100--198. Both Peoria newspapers, the Star and Journal, declared headlines that LaGrange was the state champion with Central second. However, team pictures declared Central the winner and the IHSA records list Central as the state team champion. The reason: in team competition points were awarded on a 10-8-6-4 basis for the first four teams. Individually, they were awarded on a 6-4-3-2 basis. Thus, with Modjeska finishing second and LaGrange having no golfer in the top four, Central had 12 points and LaGrange but 10, making Central the state champion. After 1941 that point system was abandoned.